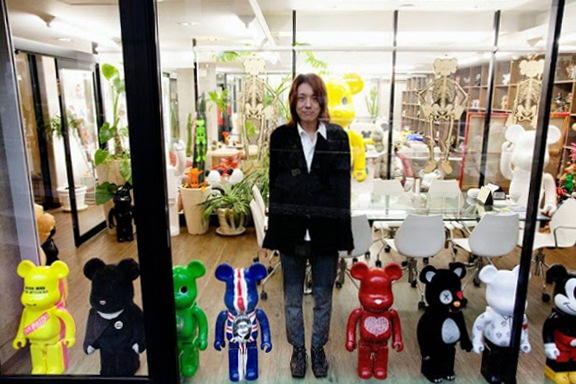 Not a stranger to cute and all things pop-culture, Tatsuhiko “Ryu” Akashi’s empire of figurines -- known simply as Medicom Toy of which he holds the position of CEO -- brings forth the childhood obsession with toys and the adult fixation with collections together into one cohesive world. His formula is simple; use a basic-yet-now-synonymous-with-the-culture silhouette, add color, throw in a theme and make it accessible to the masses. The result is the Be@rbrick -- a cross between a humanoid bipedal with the distinctive extremities of a teddy bear. His creations have spanned the gamut of all things cool and coveted, from The Beatles and Andy Warhol commemorations, to Star Wars, Daft Punk and even Mercedes-Benz. But don’t peg “Ryu” as a textbook case of someone with a deep Peter Pan Syndrome and a lack of cool -- his collaborations reach the highest echelons of style and fashion, as numerous brands clamor to work with the famed company and its CEO like Stussy, GoodEnough, Levi’s, NEIGHBORHOOD, Porter, U.N.K.L.E. and so many more. If “Ryu” wanted to build an army of toys, he’d have outposts in all corners of the world, with soldiers color-coordinated and ready to attack in 70%, 100%, 400% and 1000% sizes by the millions.